Langham Tower intake for 1952-53. The University of Sunderland has been identified as one of the top providers of both Primary and Secondary Teacher Education – and has notched up more than 100 years in teacher training. From the modest foundations of Sunderland Teacher Training College – where 70 students first enrolled in 1908 at a cost of £10 to be taught by a team of staff which included a Swedish drill master – the University has gone on to achieve a global reputation of excellence in the field of education. In 1908 the Teacher Training College began in Westfield House, opposite the Technical College, in Green Terrace with the premises possibly sold to the Technical College by a member of the Richardson family. In 1922 the Training College moved into the Langham Tower building on the Ryhope Road. 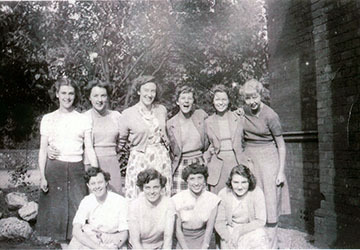 At the same time the College became 'women only' and remained that way until 1959. Under its last principal, Mr H Armstrong James, the Teacher Training College reached its zenith with 820 students and 80 staff. For more than 80 years Langham Tower was in the hands of the University until Sunderland High School purchased the building as well as Armstrong James Building in 2004. Langham was built for William Adamson, the son of a prominent shipbuilder and shipowner, as a private house in 1891. After his death the building changed hands several times and was rented by the Vaux family at one point, before becoming home to Sunderland Teacher Training College in 1922 with 146 students. Over the next fifty years, a number of other buildings were added to the college. Most were former private houses, but in 1962 a new library block (Armstrong James Building) was built in the garden of Langham itself. The design of Langham was reportedly based on Cragside, Norman Shaw’s famous house in Rothbury, Northumberland, built for Lord Armstrong. There are certainly many internal and external similarities. The Tall Tudor chimneys, the half-timbered, gabled turret set behind ornamental battlements all seem to be repeated from Cragside. In 1963 Mr Quintin Hogg (Lord Hailsham) suggested the Training Colleges should be called Colleges of Education and the Sunderland College of Education began. Sunderland Technical College opened a new Education Department in 1967 which wasn’t linked to the College of Education at Langham Tower. The Head of the Department was Mr H Miller who interviewed all students prior to admission. The Technical College had refurbished four old Victorian houses in Thornhill Park. All lectures, apart from the large main Education lecture on Wednesday mornings in the Edinburgh building, were held in Thornhill Park. The Education Department moved from Thornhill Park to the Forster Building in 1971. Lee Puchala was part of the year group for the first intake in 1967. He said: “The most unusual aspect of my career in Sunderland Polytechnic was my Education Lecturer for the Cert Ed, Mr E Haswell, who was also my lecturer for the BEd and subsequent MEd. I first met him on my first teaching practice in Thornhill School where he taught Geography. In 1973, as a Polytechnic, Sunderland created the first part-time, in-service BEd (Bachelor of Education) programme in the country. In 1975 the College of Education was merged with Sunderland Polytechnic and for three years Langham remained the centre of the Faculty of Education, until further changes in 1979 saw it adapted for use as an administrative centre. Group of 10 women at Langham Tower. Now programmes from the Department of Education are taught at the City Campus and Sir Tom Cowie Campus at St Peter's. Placing research at the heart of teaching – backed by a new Centre for Pedagogy – the University continues to help mould and shape students to become the teachers who will inspire the next generation of children. Former Director of the School of Education from 1997 to 2003, Professor George Shield joined the BEd course at the Polytechnic in its second year of operation. He explained: “It was the first in-service Bachelor of Education course in the country and as such was very experimental. As its name suggested it was for teachers who were already qualified but who hadn't got a degree. “The course itself was purely based on educational theory, i.e. no 'subject' study. We studied topics in philosophy, sociology, and psychology together with curriculum theory, development and organisation. The programme lasted three years and consisted of two evenings a week and three long weekends each year. Professor Shield returned to the Polytechnic a few years later as a teacher on the team that developed the Master of Education programme. He said: “This again was of a new format. It was essentially research based with a large element of curriculum development and educational management. This concept of basing curriculum change on research based theories was quite revolutionary but was also useful in that it informed what you were doing in school and why. Memories forged at Langham Tower still remain strong for many alumni. Tim and Jean Blewitt met while studying at the College of Education from 1968 to 1971. Jean shared her vivid memories with us: “I started College in September 1968. Feeling a little nervous I left my 'digs' in Ashmore Street and took the short walk to Langham Tower for my first day of Teacher Training in Sunderland. I thought the building looked impressive and was looking forward to my three years of training in the PE department. Pictured above: Tim and Jean Blewitt 1968 and 2015. “Walking through the entrance with lots of other 'freshers' I noticed the wonderful sweeping staircase with lots of guys leaning over the top rail. They were all chatting and obviously discussing the new girls as they walked in. When I got to the top of the stairs one bearded young guy introduced himself as Tim Blewitt and told me that he played for the college rugby team. “We chatted for a while and he asked me if I would like to go to watch the team play the following Sunday. As I quite fancied him I thought that I definitely would. I stood on the touchline with another girl and asked her who she had come to watch, "Oh, Tim Blewitt" she said, "He's my boyfriend!" Sheila continued: “In lighter vein! The Social Committee at last got permission from Miss Williamson to hold a College Dance in Bede Hall which had just been newly opened. The evening was a great success and we were all delighted, thinking of pleasant times ahead. Next morning the committee had to meet with the Principal to be told that there would be no more dances because beer bottles had been found in the men’s cloakroom. I don’t know how long it was before this rule was revoked! We are glad to confirm that many born teachers came out from Langham Tower and are still coming out from the current Department of Education.